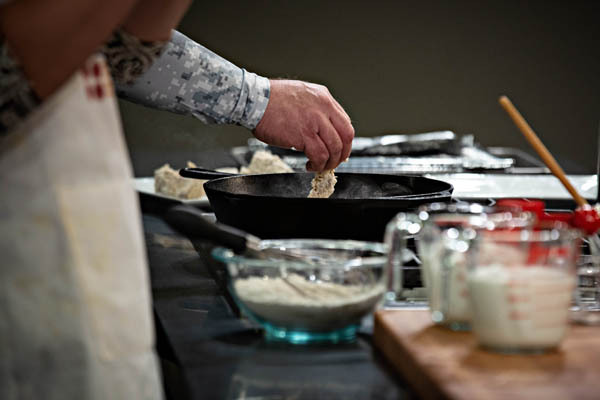 As the Food History Team pondered the roster for the 2018 Food History Weekend cooking demonstrations, we knew we wanted to feature a chef who had game—someone whose background included hunting, trapping, and cooking in a region of the country we hadn’t yet explored. So when Oklahoma native Jason Flores came to our attention, we jumped at the chance to learn about his boyhood along the Verdigris River, where his family regularly prepared meals featuring wild game and foraged foods. As the executive chef at the Hilton Sedona Resort at Bell Rock, Flores has moved beyond the dishes from his youth, but when we contacted him about sharing those regional favorites and his experiences from home, he was ready to come to Washington and do just that. When we initially asked Flores to share a few recipe ideas from his past, he recalled his Granny Williams’s apricot fried pie, and other family recipes like grilled frogs legs in buttermilk secret sauce, Okie fried catfish, wild boar chorizo, and buttermilk fried squirrel with pimento cheddar biscuits and gravy. With an array of options, I consulted our museum’s demonstration kitchen manager, Kathy Phung, for help in deciding. We both liked the Southwestern influences present in the chorizo recipe and agreed that the squirrel would be an excellent way to showcase Flores’s creative use of wild game in Southern cooking. Squirrel has long been a source of protein in American cookery, along with opossum, raccoon, rabbit, and muskrat. It is common to find recipes for game in historic regional American cookbooks. Mary Land’s Louisiana Cookery (1954), for example, has several recipes for squirrel, including squirrel head potpie and squirrel stew. The latter recipe begins: “Dress forty squirrels. Place the squirrels in a big iron pot over coals. Place three bottles of cooking oil in the pot. Let the meat braise for ten minutes . . .” and so on. 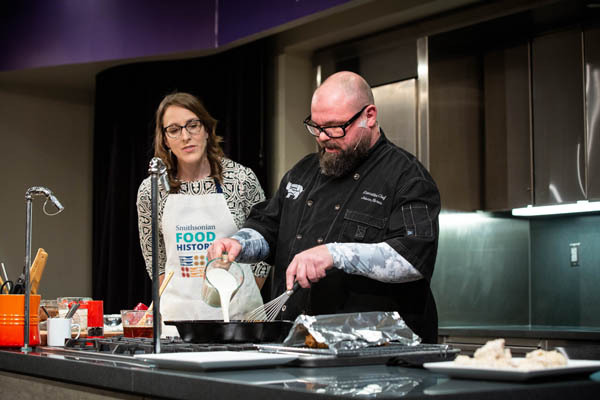 Like Land, we were going to attempt to engage our audience and learn about the uses, past and present, of squirrel in American regional cuisine. How in the world were we going to get fresh squirrel meat to the National Museum of American History demonstration kitchen? Wegmans provides most of our cooking demonstration ingredients through an in-kind donation, but they do not stock squirrel. Our program producer, Katharine Mead, found a potential solution. In late August, she reached out to Ailsa Von Dobeneck, a chef and writer residing in New Orleans, who demonstrated how to make President McKinley’s squirrel soup at our museum in 2016. (The subject line of the email? “Hello! And squirrel question.”) After exchanging a few messages, Von Dobeneck confirmed that she had reached out to her network of Louisiana-based hunters—as she put it, “a TON of guys in the bayou”—and would keep us posted. Bound and determined to help us, Von Dobeneck reached out to a friend who regularly hunts in the Louisiana bayous. He delivered on his promise: three squirrels, to be exact, shipped frozen on dry ice via FedEx. They were exactly what we needed for Chef Jason Flores’s recipe. Flores arrived a day prior to his cooking demonstration to prepare the squirrel, expertly butchering the meat for the dish that his grandfather regularly made for him. Flores then soaked the meat in buttermilk to tenderize it. Squirrel, like a lot of game meat, can be tough, so taking the extra step can make a big difference once you batter and fry it (in rendered bacon fat, as recommended by Flores). Flores mixed in some wild boar chorizo he brought from Arizona to the gravy, adding a full-bodied richness to the dish. The final touch? Pimento cheddar drop biscuits, baked fresh the morning of the demo. Now that’s a dish that brings the outdoors in while representing the historic and lasting importance of game in regional American cooking. If you are interested in trying out this recipe yourself, you can find instructions for Flores’s buttermilk fried squirrel and pimento cheddar biscuits on our website. You’ll have to find your own source for squirrel meat, though! 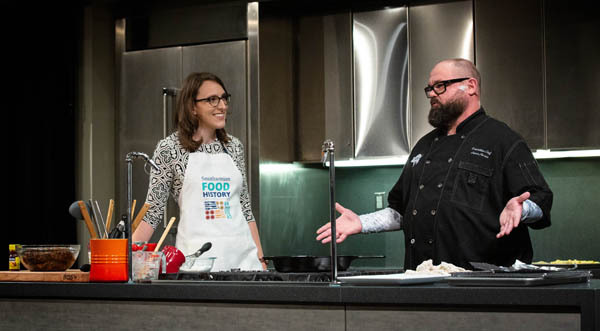 Dr. Ashley Rose Young is the historian of the American Food History Project at the Smithsonian’s National Museum of American History and is also the host of Cooking Up History. She tried the Buttermilk Fried Squirrel and was convinced that it was the best squirrel she had ever had—better, even, than her grandmother’s squirrel stew!